Those of us in Ohio and surrounding areas like to get together once a year or so to shoot the breeze, show off new toys, and cut things up. I have August 5th or August 11th available. Do either of those afternoons work for people? I'd host, and I live on the north side of Cincinnati. Believe it or not, this year, either of those days work for me! And despite culling my collection this past year, I've got a new thing or two to bring. Preference would be August 11. I haven't heard back from everyone, so I'm not set on a date, but it may be the 11th rather than the 5th. I'll have food/drinks, but need to track down some pool noodles. Unfortunately, we're too early for pumpkins. I'm going to go ahead and say it will be the 11th. Most people seem to think that might work. It also gives me a little more time to track down cutting targets. Let's say we'll start around 2pm. PM if you haven't been here before and need directions. Sounds great. I'll message you my address/contact info. I'm on the north side of Cincy, near the big Ikea store (no, my house was not assembled with an allen wrench:)). It'd be good to see you again, and for longer this time. -I'm planning on grilling for dinner (burger, brats and/or sausages, veggies[?]) and will have some chips, drinks, snacks. If you have special dietary needs or want to bring food/drinks/etc., just let me know. I'll try to have dieter-friendly stuff around, not just junk (though there will be junk). -I'll have some pool noodles for cutting. Feel free to bring more, or jugs to fill with water, watermelons, etc. We'll cut until there's nothing left to cut. -I have cats, so allergy sufferers take precautions. -If you have a long drive and need a place to crash overnight, there's space here. Just let me know. Sure I can make the 11th! It'll be great to see everybody! Chad, do you still have your A&A Edw III? If so, I'll leave mine at home but I'll have my usual WMD's. Looking forward to the gathering Saturday. The weather should be beautiful, with highs in the upper 70s (in August!). 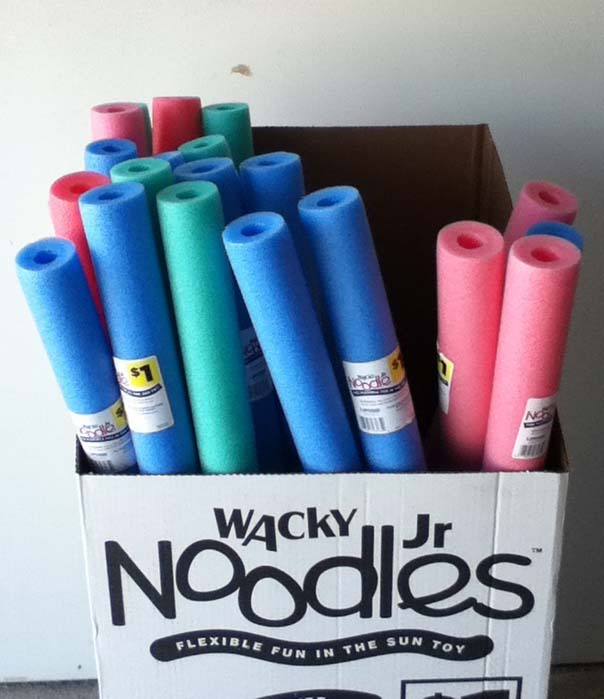 I'm stocked up on pool noodles and trying to get a final count so I know how much food I need on hand. Those pink ones must really be taunting you! My wife advised me today, in the middle of anational sales meeting which was most helpful, that I now have a 1:00 PM appointment on Saturday. That might just take me out of circulation for a cutting party in Cincy. We'll be here at least through dinner time, so stop by if you can. I saw this way too late to make the drive down from Michigan, but if you do this in 2013 I can probably swing it, i have relatives from Louisville I need to visit anyhow! ‎"Eyes that fire and sword have seen / And horror in the walls of stone / Look at last on meadows green / And trees and hills they have long known." And.... our alternator just went out! Seems things just get in the way always at the last minute. It's being towed to the shop as I type, and if they can get it worked in soon, I might be there. There was a question whether the re-manufactured unit would be in stock, so as of this moment, I'm not coming, but if they get it fixed by Saturday morning, I could still make it. Just got back in tonight (very late) from Austin and now I'm going to be out of town for the rest of the weekend doing family stuff (that's what I get for being gone all week). Sorry, it's been awhile since I've missed one of these and would really love to see everyone. Make the pool noodles suffer!